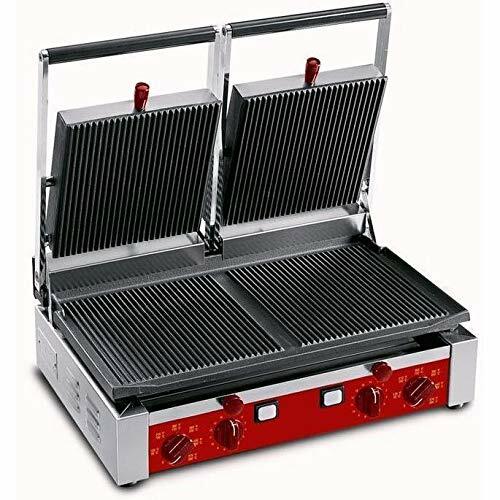 The Panini Grill is a powerful European cooking device. You can easily and quickly please and surprise your customers by serving the fanciest, hot and European-style "panini". It can be installed in minutes: make the electrical connection and you are in business (120V-60Hz for the single unit and 220V-60Hz for the double unit). In most cases, the Panini Grill can be operated without an exhaust hood. The quick operation and the high temperature (450°F) ensures the melting of cheeses and the heating of your ingredients without removing the natural moisture and taste of the food. NOTE: This is a FREE SHIPPING, freight only item and must ship to a lower 48 business or commercial address to qualify. Shipping lead time is 5-10 business days. Residential surcharge is $60. Image is a representation. Actual product may vary based on model, size, and options selected. Considering a large restaurant equipment purchase We offer financing options. Check out Voltage Restaurant Supply to learn more.